Steel Storage has over 20 years’ experience across the world in Self Storage building, design, construction and consultation. We have built over 1 million Self Storage units and have consulted, designed and developed Self Storage facilities throughout Asia, Australia, New Zealand and Europe. The Asian Self Storage market is one of the fastest growing in the world. Steel Storage has been at the forefront of the emergence of the Industry and is a founding member of the Self Storage Association of Asia. Steel Storage creates value for our clients and their stakeholders through our experience, knowledge, market leading Self Storage services and products. We are the partner of choice worldwide for leading Self Storage operators. Steel Storage has over 20 years’ experience across the world in Self Storage consultation, design, building and construction. We have built over 1 million Self Storage units and have consulted, designed, built and developed Self Storage facilities through-out Australasia, Asia and Europe. We have the services and products to assist with your Self Storage construction project from the beginning and can support you throughout your ownership. 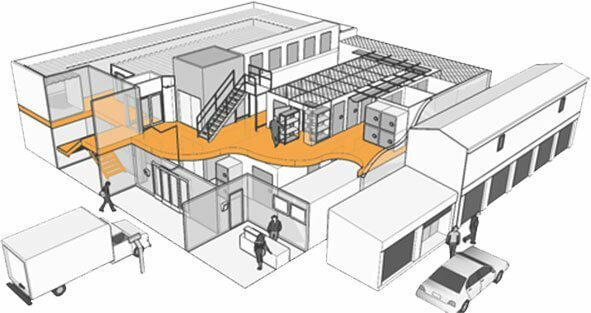 Looking to design a storage facility? To avoid making costly mistakes when entering the Self Storage industry, early consultation is essential. Our experienced consulting team at Steel Storage will explain the options available to you and the feasibility of your project before the design process begins. We can provide advice right from the start including property sourcing, feasibility assessment, structural assessment and the approval process. At Steel Storage we have the best installation teams in the Self Storage industry, from our traditional unit systems to CCTV, access control systems and the latest in security products. We follow a coordinated, fully integrated approach on all jobs, and we are aware that time is money and our approach endeavours to deliver every project defect free, and in the fastest timeframe possible. Good design is critical for the success of Self Storage in today’s challenging business environment. Our in-house design team can design your Self Storage facility with the best unit mix to appropriately satisfy market demand. Steel Storage staff seek to identify value-add opportunities at all times, and design the best possible facility for every site. Steel Storage uses only the very best quality materials in all of the products we manufacture. This includes our patented petitioning system, high gloss corridor paneling systems, swing doors and door locks. Our manufacturing lines in Asia and Australia employ certified quality assured programs and industry best practice to produce consistent, quality products from both facilities. Our commitment to research and development ensures that our products continually provide clients innovative Self Storage solutions. Visual appeal, safety, functionality, ease of use, efficient installation and cost effectiveness are all considered when developing products that will enhance the appeal of your facility, improve the customer experience and delivering value for money. Self Storage facilities now contain sophisticated, integrated systems, from security to the latest fire management and surveillance solutions. To optimise the utilisation and performance of these systems our support team provide ongoing, comprehensive technical assistance. We continue to partner with you to ensure the success of your Self Storage business. "Over the last 25 years we have successfully partnered with Steel Storage on a variety of projects in Australia and across Asia. We value the Steel Storages products, track record and manufacturing presence in Asia. We have not found another Self Storage product which can match the standard, quality and design of those products delivered by Steel Storage"